The subway would shut down at midnight on Friday and Saturday nights and 10 p.m on Sunday. The reason: so the agency could have more time for maintenance projects. It doesn’t look like this is being warmly received by riders. As for L.A. Metro, some train frequencies were recently cut after 8 p.m. but there is service until after midnight throughout the week and until at least 2 a.m. on Friday and Saturday nights. Good post by Damien Newton updating the bullet train’s progress — of which there has actually been some! As I’ve written umpteen times, I think this is a project that will do a world of good for California. But it’s also a project in which the cost has often been a moving target and funding is from secured or assured, something proponents sometimes forget to prominently mention. The latest news boiled down: construction is underway on a short stretch of track north of Frenso; the state agency overseeing the project decided this year to first build the north-of-Bakersfield to San Jose segment of track, and; the same agency forecasts there is actually funding available to do that — but it’s relying on the somewhat uncertain future of the state’s cap-and-trade system. If these numbers hold, it looks like a significant stretch of track could be done — although the plan is extremely reliant on those cap-trade funds, which may be vulnerable to attacks in the courts and/or the Legislature. Still, San Jose is significant because it offers quick Caltrain connections into San Francisco and connecting transit to other parts of Santa Clara County, which includes Silicon Valley. The CAHSR says the plan is start rail service between the Central Valley and San Jose by 2025. That’s not obscenely far into the future. Another significant source of funding will be the revenues generated by the system itself. 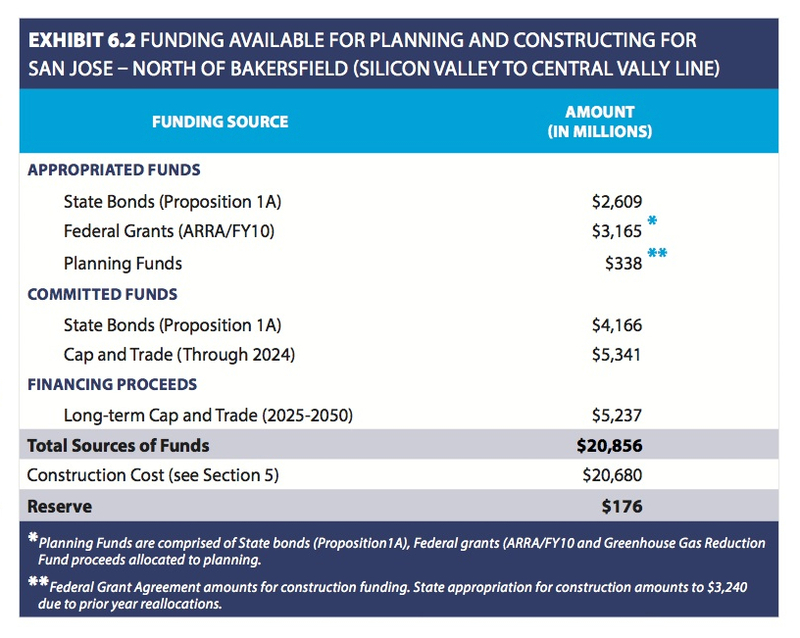 Once the Silicon Valley to Central Valley line is built and in operation, it will become a viable commercial enterprise, generating revenue and almost immediately producing positive cash flow. Upon demonstration of a level of operational maturity, this positive cash flow will be monetized through financing and private investment that will help fund future development of the system. As has been demonstrated in other high-speed rail markets, private sector operators are expected to invest a considerable amount to own the rights, through a concession, to the long-term operations of a commercially viable high-speed railway. Current estimates indicate that more than $21 billion, or nearly 1/3 of the total development costs, could be raised through the future sale of long-term concessions for the full Phase 1 system. 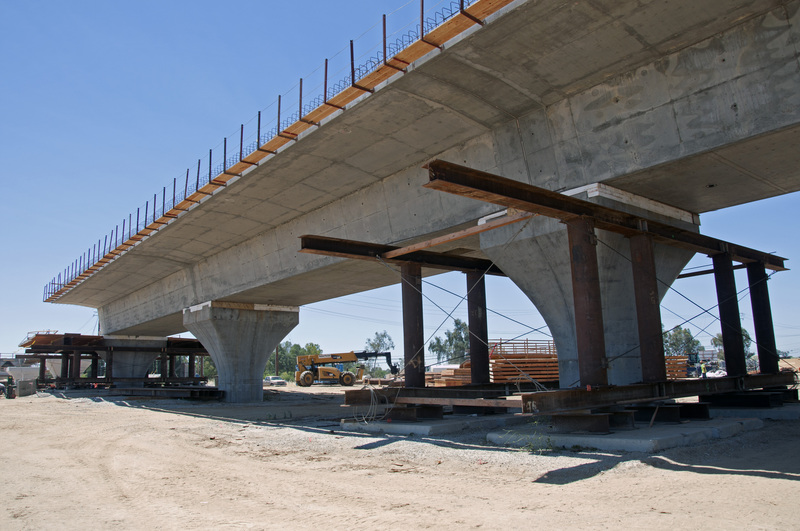 A bridge that would take bullet trains over the Fresno River takes shape. Photo: California High-Speed Rail Authority. Will all this work out? Hard to say, as America’s experience with bullet trains and bullet train financing is non-existent. This project is the first of its type in U.S. of A. Which is kind of cool. And kind of scary. Damien writes that “for now CAHSR finally seems to have the wind at its back,” and I’m inclined to agree. I have zero doubt the thing would be very popular if properly built and the service is good. The appetite for non-car options throughout the Golden State remains strong; it seems like it’s just a matter of building good sidewalks, bike lanes/paths and transit projects. Not so fast, says LAT columnist George Skelton. He doesn’t sound like much of a fan of cap-trade, even if its purpose is to limit greenhouse gases that cause global warming. And he sounds dubious that cap-trade will be around long enough to further fund the bullet train. But Skelton throws a notion into the wind: Republican presidential nominee Donald J. Trump has mentioned his envy of bullet trains while on the stump although he has said nothing specifically about the California project and nothing about how he would actually get these kind of projects built. Another glitch: Some of the heaviest support for Trump is likely to come from the Central Valley, where many residents and officials oppose the bullet train project because it’s disruptive and requires property. All in all, interesting times. Putting aside presidential politics, there does seem to be a ray of hope for the bullet train. There are transit expansions underway at both ends of the bullet train’s first phase in San Francisco and L.A. and much talk of future plans. Imagine the day someone could take the bullet train to Union Station, switch to the Purple Line and be in Century City in 20 minutes. That would be nice. Slooooowly, California may be inching ahead toward a more rail-oriented future — or at least one that’s not cars, cars and more cars. Quasi-related: The bullet train will stop at Union Station, which Metro owns (in addition to some surrounding property). The exact location of the platforms for high-speed rail is yet to be determined/finalized, but the video below gives you an idea of the planned changes for Union Station under the facility’s master plan. As for the bullet train platforms, that’s being studied as part of the “Link Union Station” project that would allow Metrolink and Amtrak trains to pull into LAUS from either the south or north to save time. Yet another study trying to decide which metro area in the country has the worst traffic. This one says that the Washington D.C. region has regained the top spot and we’re now second, although the commute on the 101 between Topanga Canyon Boulevard and DTLA is tapped as the suckiest in the nation. To which I say there is often parking available at Orange Line stations (as well as bike and bus connections) for those willing to take the bus to the Red Line in NoHo. And soon you won’t have to take the crosswalk across Lankershim Boulevard between the Orange Line and Red Line; there instead will be a nice new pedestrian tunnel (opening date: coming soon). Good news for the most part, unlike Tampa Bay where I live has its gear stuck in reverse building toll roads. What a boondoggle unless all those silicon valley folks want to live in fresno and commute daily if it can even make that a viable commute time and costwise who is going to ride that. Don’t use china as an example because their airlines are not as developed and a plane ticket is way more expensive then the high speed rail there. I think I’d use it. There are a lot of people who don’t want to deal with hassles of flying for short trips — and I think there’s so much intra-state travel, that this would bound to be used by many. Actually air travel in China is usually on par, sometimes cheaper than the HSR except over the longest distances. Their HSR network is already operating at an above the wheels profit, while their air network is hemorrhaging money and having to offer deep discounts to compete with the train. This isn’t related to this blog post, but in the last 8 days, there have been 8 disabled trains, 1 power issue, 2 signal issues, and a broken wire all on the Expo Line alone. It has led to very erratic and frustrating service for us riders. Any chance you can get us some info on what is behind all of these issues, especially the disabled trains? Let me see if I can get you a better answer than just saying “there has been a variety of issues,” which you already know. It’s great that high-speed rail is moving forward, but it’s progressing too slow and is too expensive (with funding far from certain). As I said here before, the problem is going all-out with super high speed and dedicated tracks, which can only work in an environment with secure and committed long-term funding. A better solution would have been a train that could also use regular tracks (even if it means dual-power locomotives, or a change of power on the way). The current Bakersfield to Oakland service is not that bad. Make minimal upgrades to the present freight line through the Tehachapi Pass and you have L.A. To Oakland in 8 hours (or L.A. To San Jose via the Altamont Pass). Then improve the tracks segment by segment, adding electrification, and shaving off 30 minutes at a time, while keeping useful service running. Save the expensive Pacheco Pass alignment or Angeles National Forest tunnels to when large amounts of committed funding can be secured. I think you raise some great points. If possible for us to have full-blown high-speed rail, that would be great. That said, if that proves to make the project so expensive it can’t be built, there is a lot to be said for improving Amtrak service to the point where the train is competitive with driving to the Bay Area. I know I’d prefer a six hour train ride to a six- to seven-hour drive. I’d be very interested to know if there is any project of reasonable cost that could have the two-hour Metrolink ride to the Antelope Valley down to something more attractive. I know it’s tough with the mountains, but it would be great if the train could go the 80 miles to Lancaster in 80 minutes. The line would need to have upgraded signaling so it could run above 79mph. You would then need to have additional track so as to not have any freight traffic blocking your way. Even with that though you are going to get slowed down to much in the mountains. The problem is it takes 61 minutes to go from Palmdale to Santa Clarita. That 37 miles(really 30 miles) is taking half the transit time. Straightening out the track in the canyon would give you what you wanted but is the most expensive thing you can do. Upgrading the line from Union Station to Santa Clarita would be comparatively cheap and easy. Doing that distance in 20-25 minutes would not be that difficult with signalling and electricity. The problem is it wouldnt justify the cost if the HSR to points north didnt also use that route. 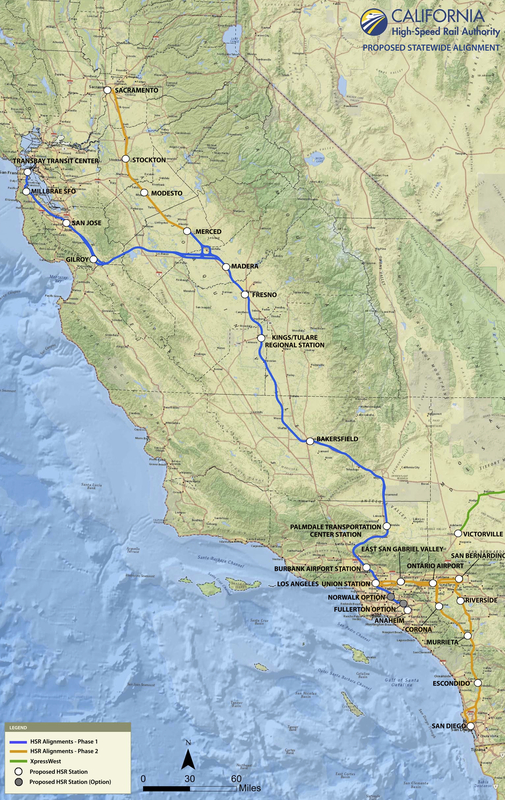 So we have to decide what is the most cost effective way to get to the central valley from LA. If it’s under the Angeles National Forest, the sooner we build that the better, but obviously it is the most costly section. If it is via Santa Clarita, we could incrementally improve things from Santa Clarita to DTLA and save the mountain pass for later, but that wouldn’t save people in Palmdale much time overall, particularly if they were only going to Burbank.